Sounds good. I was simply noting even with the ruler you reference i have noticed the width changing from player viiew during a round after setting the script. Figured WGT was just trying to keep things fluctuating... lower winds its no big deal u get up to 20 and 30 crosswinds and it makes bigger difference. Hmmm. I had not noticed that but maybe I should be checking it during play. Sometimes my misding is so bad that I wonder if it even matters!! There are many ways. I just use the aimer box = 10 yards. True, so do I. But I started this thread looking for a ruler to use when you encounter the 25-35 mph winds. The young46 ruler will not work with Windows X:P Pro. But the Ruler for Windows works perfect. But the difference for me is young46's program comes with 3 support files, one of which is a ruler.gif. It is a picture of a ruler. I had hoped to change that to compass.gif, a picture of a 360 degree compass that I could use to measure the angle of the wind sock. The Ruler for Windows does not have a supporting .gif file so I am out of luck there. I am tempted to go back to the Autohotkey program and try all the ways Scott mentioned in his posts. But it is a lot of work and I am lazy. You can always be creative and make your own - mine is scalable because it is done in 'custom desktop logo' and it is scaled to the height of the actual flagstick itself - I make a note on the scaling factor for each flag in my WGT notebook and adjust it for the approach and flag at hand. Could you tell me how you created this "cross-square"? The ruler for Windows that Don put the link for is in Pixels. I could see no way to change it to inches. I tried every option and it is just pixels. .For what I want a ruler for it must be in inches. For measuring wind drift it does not matter if the rules is in inches, ft, yds, mm, cm, or miles per hour. 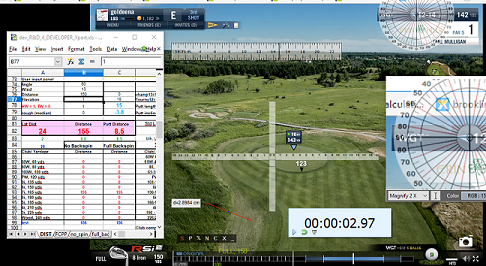 To start with you have to know the size of the aiming box and it can vary with the camera view and certainly does for certain courses. The 10 ft aiming box at Kiawah and Pinehurst measures 53 graduations on the ruler. Call it ft or miles, it doesn't matter. Therefore 1 graduation = 5.3 and a 34 ft wind drift would = 180.2 graduations. I have seen the JRuler used by various players and I believe it can be changed to inches. The thing is to put it in to custom desktop logo so you can adjust its size, it's always worked well enough for me, but that side wind is so variable I usually just make a guess these days unless its a long way out. You can also stick a 360 degree protractor in to it - just download 2 custom desktop logo programs - and overlay the wind arrow. As for rulers I use the one by 'John Kummallil' on-screen ruler it's called it is also scaleable and comes with a range of different increments like inches, pixels, percent, pica........ it's very good. I will check that one Don mentioned though, it looks good. Then there's 'magnifixer' and 'zoom+' - they are the best magnifiers I have ever come across - they have the ability that not only can you magnify any part of the screen but you can put the magnifier anywhere on the screen too, it doesn't have to be directly over the arrow itself - and this is a very important and useful aspect that most other magnifiers don't have, I wouldn't be able to do see-click with magnifixer if it didn't have this property, just magnify the wind arrow so you don't strain your eyes reading off the angle. It's just ctrl + space and it will keep anything you want on top of the screen. Nobody said these things were easy to operate 'at first' - zoom+ is a pig until you get used to it then its an absolute doddle, they are all easy to use but you must spend some time getting familiar, I can't download you all a silver spoon as well you know lolololos. You can use any picture of a ruler with young46's autohotkey files. Save a picture of one off the web, or make your own if you're handy with a graphics program. Here's two I made earlier..